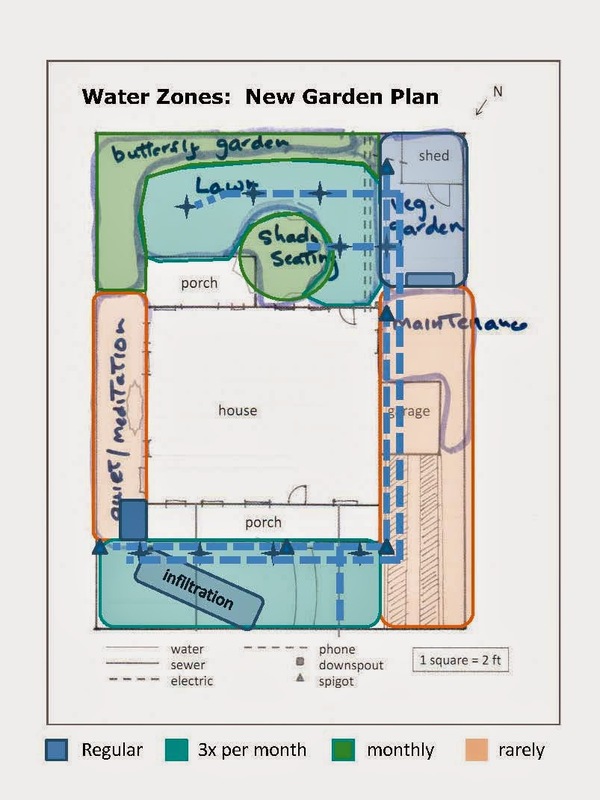 Last month (February 2014) we considered several topics critical to managing your garden water: setting water goals, Water Zone gardening and capturing/using rainwater. 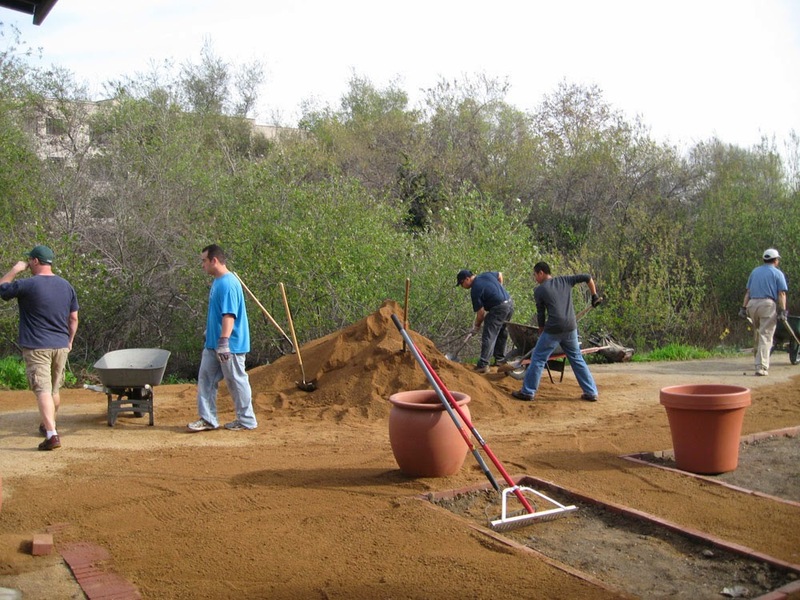 If you didn’t catch the February post, we suggest that you read it before you continue: http://mother-natures-backyard.blogspot.com/2014/02/designing-your-new-california-garden-9.html. If you’re new to the ‘Designing Your New California Garden’ series, you might want to start at the beginning (July, 2013; http://mother-natures-backyard.blogspot.com/2013/07/designing-your-new-california-garden-1.html ). The monthly posts and exercises introduce you to the ‘New California Garden’ concept and to our example garden at 112 Willow Street. By this point you’ve probably guessed that the ‘irrigation system’ in the New California Garden is not likely to be a conventional, one size fits all ‘sprinkler system’. 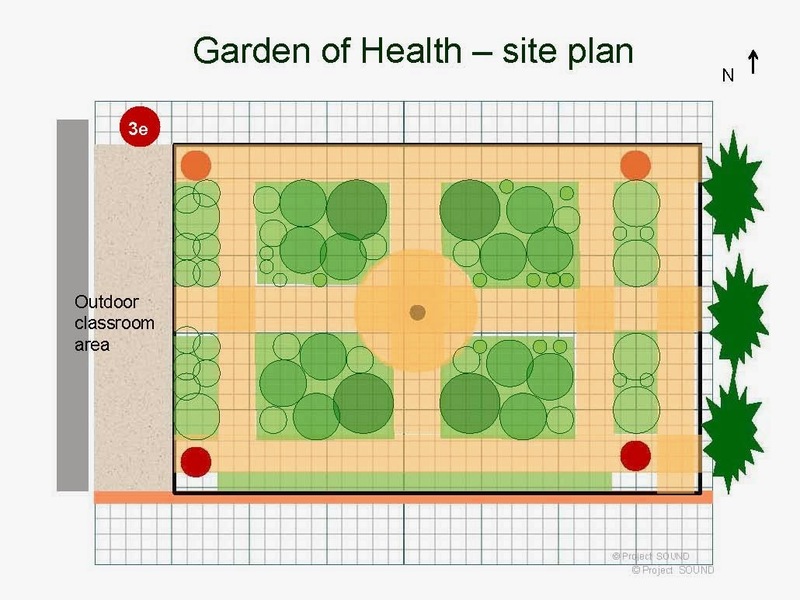 Instead it will be tailored to the Water Zone Plan, site characteristics and the needs of the gardeners themselves. Part of the trick to designing a functional and enjoyable garden is to look honestly at your own needs and constraints. Proper watering of native (and other) plants is at least as important as selecting the right plant for a given water zone. More native plants die in home gardens due to improper watering than almost any other cause. An irrigation system that allows you to water plants easily and properly is key to a successful garden. And because your garden will mature – and climate will change – your irrigation system must also be flexible. Your ‘irrigation system’ can be anything from a simple spigot and hose to a complex automated irrigation system (or some combination of both). There’s no one system that’s right for all gardens. If your landscape plan includes more than one Water Zone – or if your site is anything other than a small flat piece of ground – you may need to use several types of irrigation methods to water everything properly. Fortunately, you have several options to choose from – and plenty of resources to turn to for advice. We summarize the benefits, limitations and best uses for the most common types of irrigation methods used in Southern California at: http://www.slideshare.net/cvadheim/irrigation-methods-for-southern-california-gardens This table reflects our experience with watering native plants in western Los Angeles County; other experts may present other points of view. Realize that the relative advantages and disadvantages vary with climate, soil and other factors. Much of the readily available information on watering native plants – both on-line and in books - is directed to gardeners in central & northern California, or in desert areas. While generally useful, remember that such information is not specific to our unique climate(s) in western Los Angeles and Orange Counties. 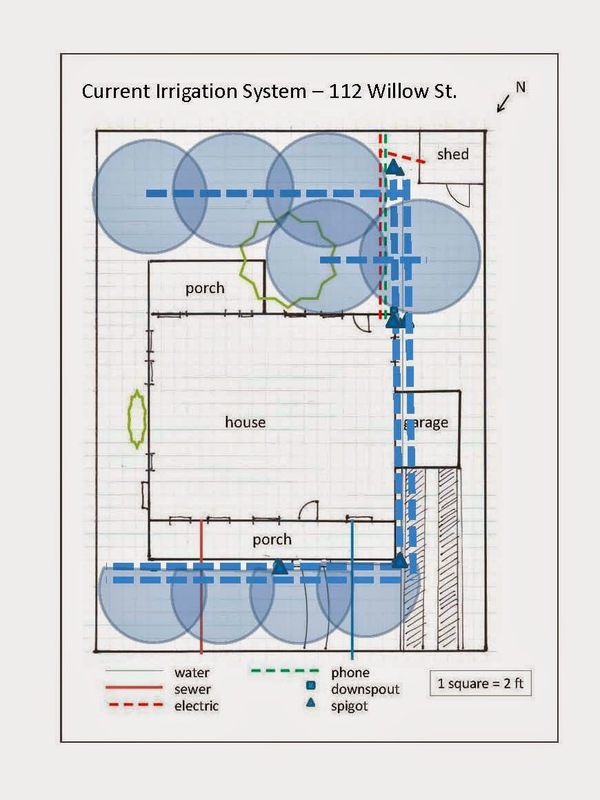 Planning an Irrigation System: Example from 112 Willow St.
It’s easier to plan your own irrigation system once you’ve seen a worked example. So let’s design a new irrigation system for 112 Willow Street. 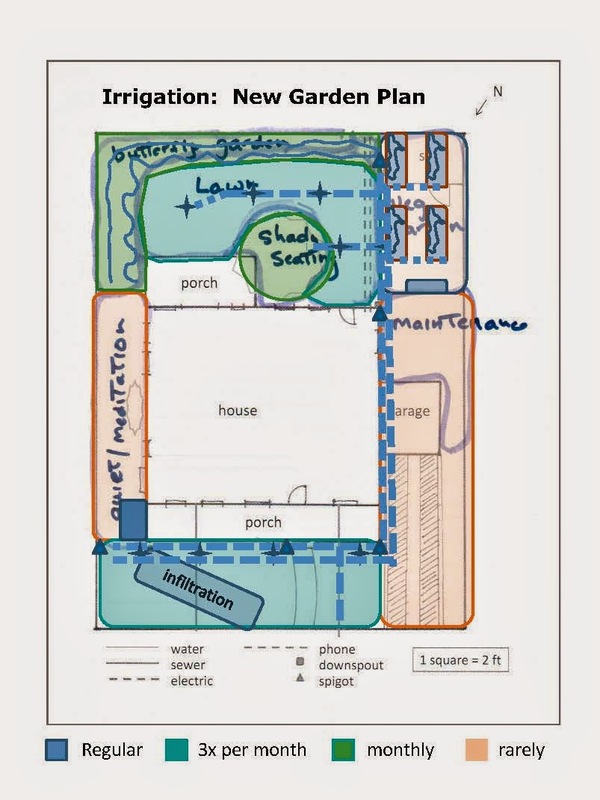 The current irrigation system for 112 Willow Street is shown on the site map (above). The ‘system’ may be similar to your own. It consists of two separate water lines: one line that supplies conventional sprinklers (front and back) and a second supplying 4 hose bibs (spigots). The sprinklers are controlled by two timers: one for the front yard and one for the back. The backyard timer has two stations: the northern part of the backyard (nearest the house; station 1) and the rest (station 2). As discussed before (February, 2014), the front yard will be left as is for now; the automated sprinkler system will continue to water this area every 10 days for the near future. However, in considering the irrigation needs of the entire yard, we realize that an additional spigot at the east side of the front yard would greatly facilitate watering the ‘meditation garden’. We add this to the Irrigation System Map, even though the installation may take place several years in the future. The backyard sprinkler system won’t need a lot of modification to make it suitable for irrigating the new lawn (see above). One sprinkler head is superfluous and another would be better if moved slightly. That and some new, water efficient sprinkler heads with the correct spray radius (8-10 ft.) and we’re in business. The sprinkler system will likely provide all the water needed for the ‘shady seating’ area as well. If not, we can supplement occasionally with a hose and sprinkler. If you need more information on irrigation systems and their design we highly recommend the following tutorials: http://www.irrigationtutorials.com/ . Planning an irrigation system for the vegetable garden requires deciding how the space will actually be used. 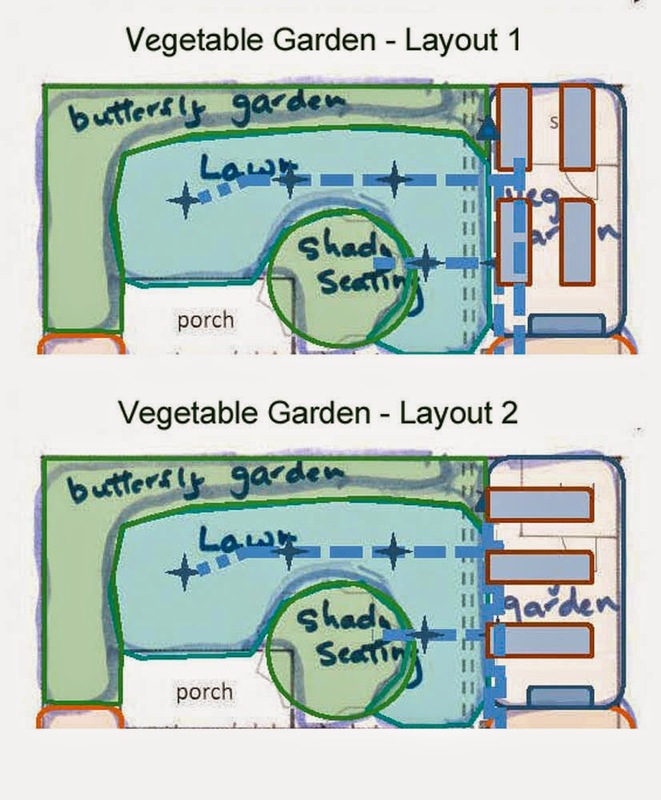 The gardeners like raised beds, and there’s room for at least two different configurations, each providing 120-130 square feet of growing space (see below). The gardeners will consider how to arrange the raised beds and will design them next month (April 2014). Whatever the configuration, they’ll want an irrigation system that’s flexible and as water-wise as possible. The gardeners decide to use inexpensive ooze-type soaker hoses, covered with mulch, to water the raised vegetable beds. This will allow them to water only the planted areas, leaving the pathways dry. Installing a hose bib for each bed will give the most flexibility. The soaker hoses can be attached directly to the hose bib in each bed. And each bed can be controlled separately, providing the right amount of water for each crop through the growing season. During most of the year, the gardeners will control the water manually, as needed. This is, in fact, the most water-efficient method of irrigation. But what about during the three week summer vacation when the gardeners are routinely away? 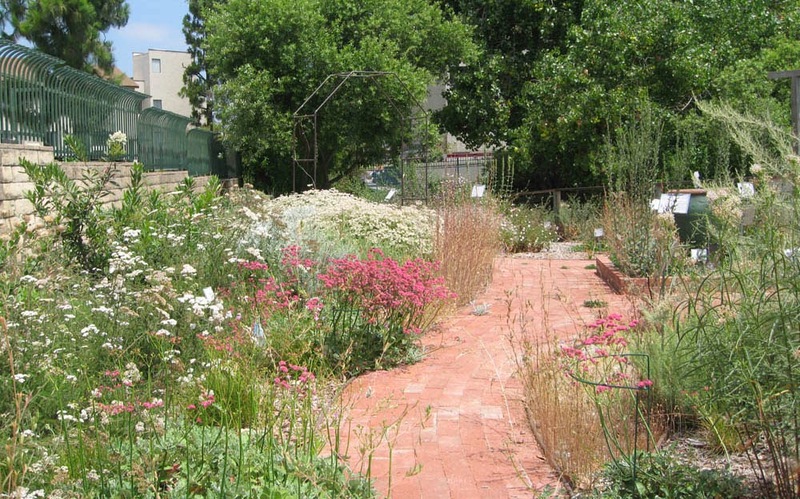 The ‘butterfly garden’ area, which is on a 6-9% slope, has presented an irrigation challenge in the past. The gardeners plan to install primarily water-wise plants – and place the most drought-tolerant of these on the drier top of the slope. This will go a long way towards making the area less problematic. But even though the plants will be Water Zone 2 at maturity, the ‘butterfly garden’ will require summer water during the establishment phase (likely the first year or two after planting) and occasionally thereafter. The gardeners will need an irrigation method that is flexible; and once again, they have several options. One possibility is to use drip irrigation for the first few years. While some native plant nurseries recommend against drip irrigation, in fact this method can be useful in some circumstances in our part of California. Drip irrigation has come a long way in the past decade. For a good, thorough tutorial on drip irrigation see http://www.dripirrigation.com/drip_tutorial.php . There are many more choices of emitters including micro-sprinklers and soaker-emitters. 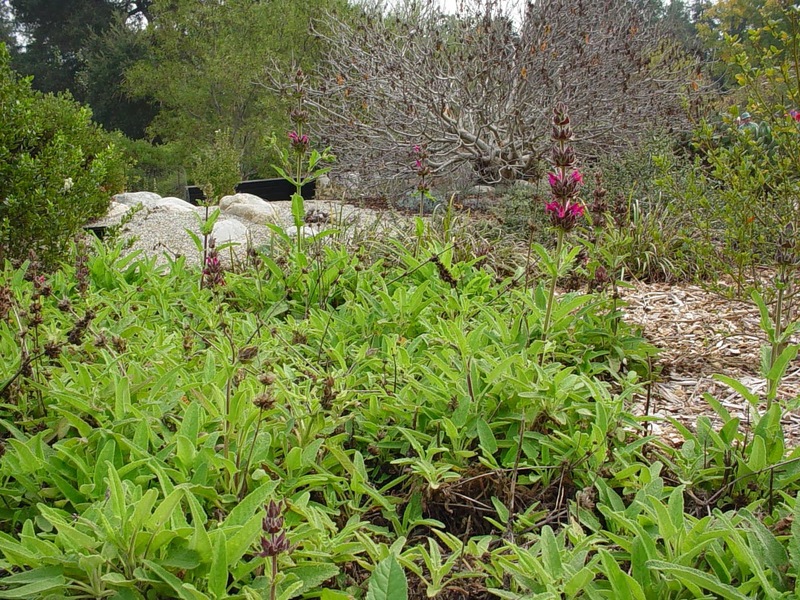 These can be used successfully with California native plants under certain conditions. In our experience, drip irrigation is best used to get plants started or for container plants. There are several downsides to drip irrigation. Drip systems can be costly, particularly if you pay to have them installed. The emitters can plug – or even pop off – during irrigation, so gardeners should inspect their emitters regularly for proper functioning. Don’t assume your plants are being watered adequately unless you check your drip system routinely!! As the root systems grow, the emitters need to be relocated to provide optimal water to the plants. Remember that the root systems of many native plants expand quickly; failure to move emitters around growing plants is another common mistake made by home gardeners. In our experience, simple soaker hoses can also be used on small garden slopes, provided that drainage is adequate and watering is done over several days. The secret is to water the area, using a slow seep rate, until runoff starts. After a few times you’ll know just how long this takes. Then water again in the next day or two. This will provide a good soaking, and can be repeated every other week, or as needed, during the first summer. The advantages of soaker hoses over drip are several: 1) lower cost; 2) lower maintenance requirements; 3) more even water coverage (good as plant roots grow out); 4) if covered with mulch they last for years, providing for supplemental water when needed. Because the top of the slope dries out before the bottom, the gardeners will use several soaker hoses to give them maximal flexibility. The soaker hoses will be installed once the ‘butterfly garden’ is planted to insure good coverage. After securing the hoses with landscaping staples (also called ‘landscape fabric pins’ or ‘sod staples’), they will be covered with mulch. They will be connected to the nearby hose bib (spigot) with a hose when in use. When not in use they will be completely invisible. The gardeners could also choose to water the ‘butterfly garden’ with a sprinkler that attaches to a hose. There are many options available – including ones that are quite attractive. This option has the advantage of being very flexible; you can just water the dry areas and not worry about areas that don’t need water. It also provides a good approximation of rain if you need to water during winter/spring dry spells. But any type of overhead watering, whether with conventional sprinklers or those attached to a hose, has several disadvantages. First, overhead irrigation is less water efficient: in dry climates like ours, some water will evaporate before reaching the ground and more will evaporate from the mulch without reaching the ground beneath. The other disadvantage, particularly for summer watering, is that overhead watering increases the chance of fungal diseases. Wet leaves and warm conditions favor the growth of fungi; and leaf splash can spread fungal spores from one plant to the next. As currently envisioned, the ‘meditation area’ will not need much irrigation once established and the gardeners plan to use stored rainwater to supply some of the water in the future. The irrigation system for this area will depend on the landscape design for this area. 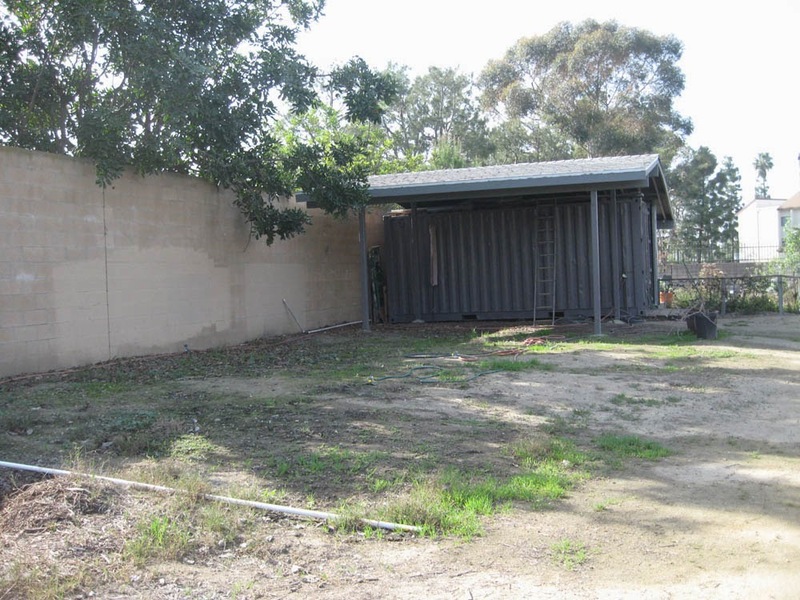 The back of the neighbor’s garage abuts this area – an ‘ugly view’. The arrangement of the seating – and choice of plants – will dictate the irrigation needs for this area. If the homeowners choose a trellis and vine to mask the ‘ugly view’ they will need to supply irrigation to the vines. Native honeysuckle vines would do well and require only occasional water once established. We’ll have to wait to finish the irrigation system for the 'meditation area’. On further review of the ‘near final’ irrigation plan for 112 Willow, the gardeners decide that having a spigot to water the meditation garden will be a necessity as soon as that area is installed. The idea of watering the area from a backyard spigot doesn’t seem workable. Compare your current system with your Water Zone map. Decide what parts of your current irrigation system are compatible with the Water Zones in your new garden. You may be surprised; conventional sprinkler systems can sometimes be modified to work. If parts of the system are no longer needed they can be capped off. And new sprinkler heads can decrease water loss to evaporation. Consider how you’ll supply water to Water Zones 1 and 2. Remember that new plants will need to be watered for at least one or two summers until they are established – and Zone 1-2 and 2 plants will need occasional summer water thereafter. · Are these choices consistent with the amount of time/effort you want to spend watering the landscape? · Are they feasible in terms of cost, skills needed to construct, maintenance requirements? · Look at your Base Map 2; are you sure you haven’t located irrigation lines where they will interfere with anything critical (like gas & electric lines). · Is the ‘system’ flexible (for example, can you change if the initial method doesn’t work well; can you use overlapping systems if you need to water one part of a Zone a bit more)? · Have you planned enough: spigots? Sprinkler heads? controllers? Are these in convenient locations? If not, now it the time to do something about it. Once you’re happy with your plan then construct a final Irrigation Plan map. Be sure to note location of spigots, location of irrigation pipes and sprinkler risers (if any) and the types of heads, and location of drip irrigation lines and soaker hoses (if any). We value your comments (below). You can also contact us directly at mothernaturesbackyard10@gmail.com . The past few months have been busy. In addition to the usual winter tasks, we’ve been installing a new garden. Mother Nature’s Garden of Health is located to the east of the main garden, just off our outdoor classroom, in an area previously unplanted. 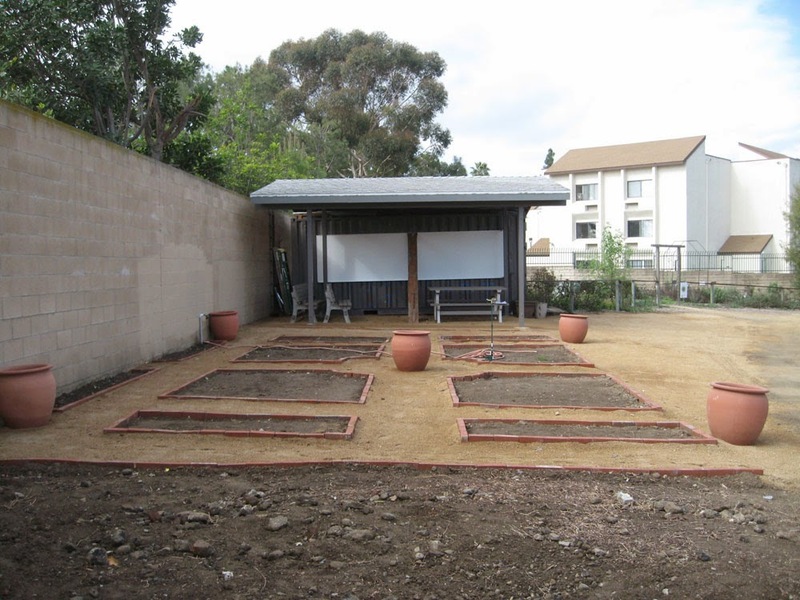 The photo below shows the Garden of Health prior to installation. 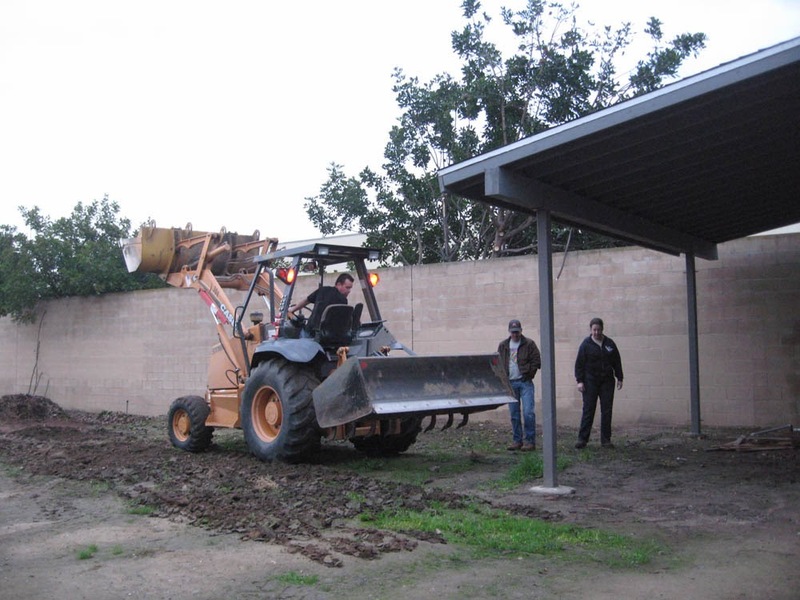 The Board of the Friends of the Gardena Willows Wetland Preserve – where our gardens are located - envisioned a garden that would complement Mother Nature’s Backyard for teaching purposes. While the main garden contains many interesting and useful plants, its size limits the number of species. As a result, a number of important locally native medicinal plants could not be included. 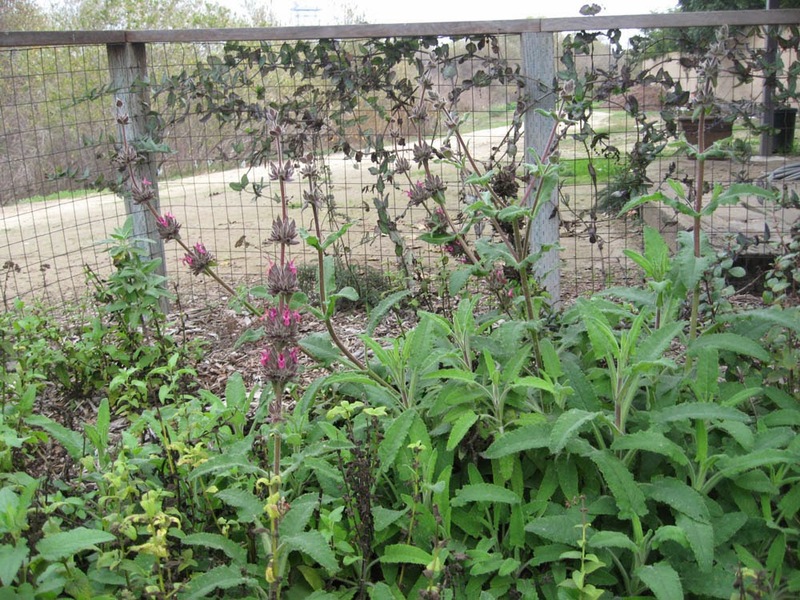 The Garden of Health features medicinal plants that either grew locally or could have been obtained through trade by local Native Californians. Thus the majority of plants once grew in the Los Angeles basin, on the Southern Channel islands or in the surrounding Santa Monica, San Gabriel and San Bernardino Mountains. The plants range from trees/large shrubs to herbaceous annuals and perennials – even a few vines. Dr. Vadheim and CSU Dominguez Hills undergraduate student Melissa Diaz – with helpful comments from Board Member Kelley Dawdy - designed the garden during the summer/fall of 2013. 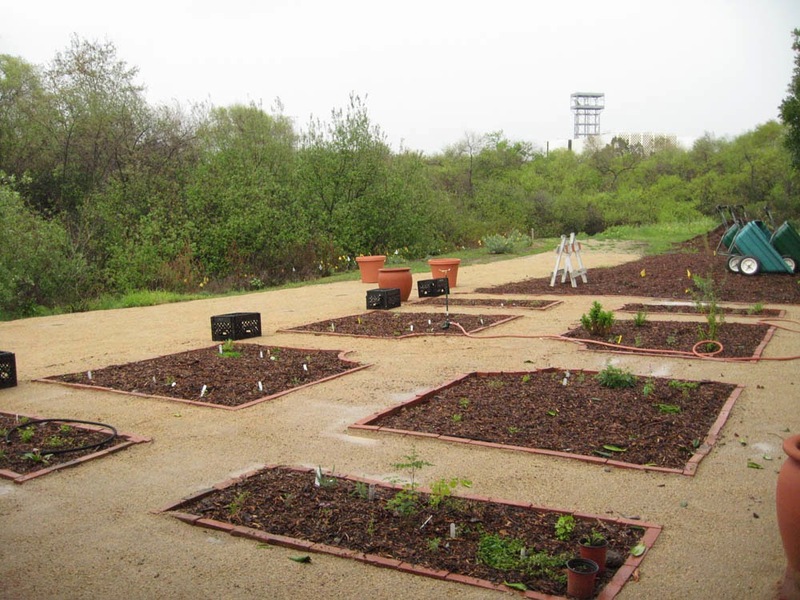 The design went through several iterations (see above) resulting in a final design that is simple, formal and reminiscent of medicinal gardens throughout the world. The formal walkways and brick-lined planting beds will work well with the plants, many of which have an ‘informal’ growth habit. 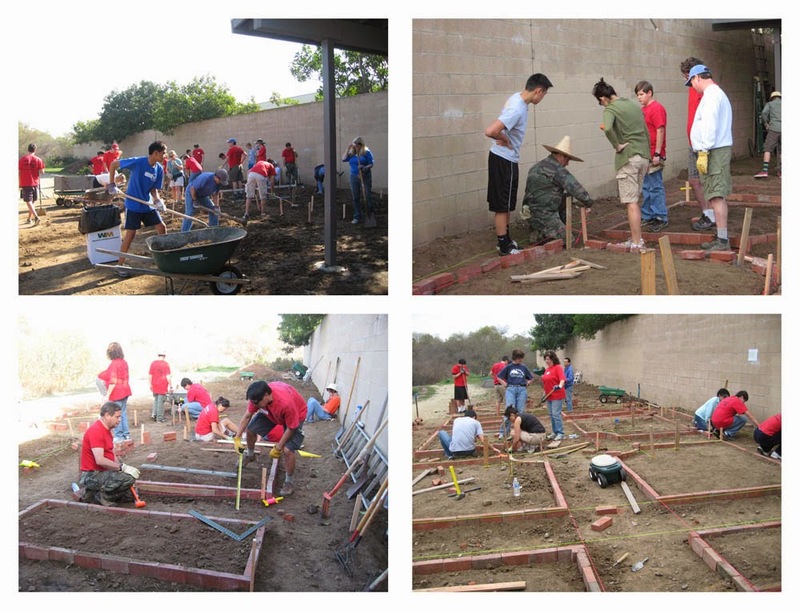 The paths, planting beds, bench and large pots were installed as an Eagle Scout project by Adam D’Jamily and Boy Scout Troop 586 (Redondo Beach, CA). 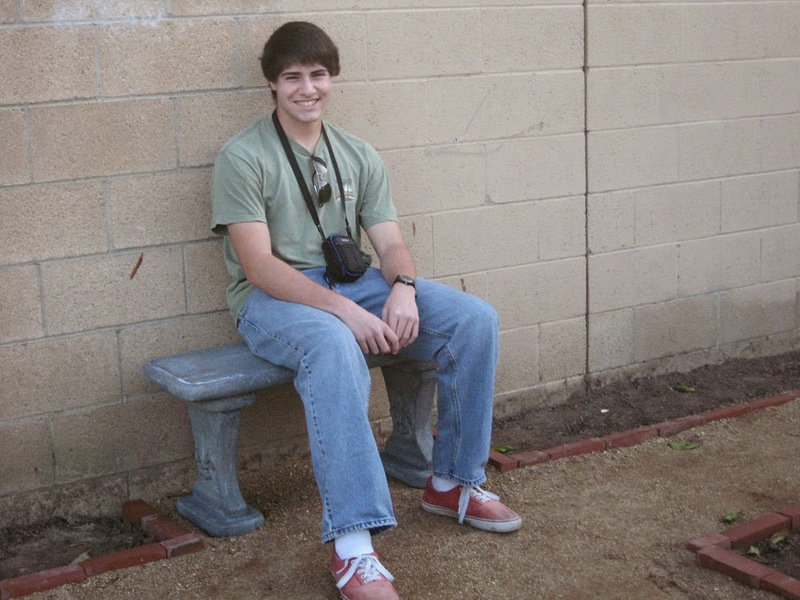 A concurrent Eagle Scout project (Andrew Harley – Troop 860, Hermosa Beach, CA ) completed the installation of the outdoor classroom. The garden installation took several days, with most of the hardscape work done on January 25-26, 2014. After mechanical leveling (above), volunteers laid out the paths and beds, leveled the ground and installed the bricks. The bricks aren’t mortared, but getting all the beds level was quite a challenge. 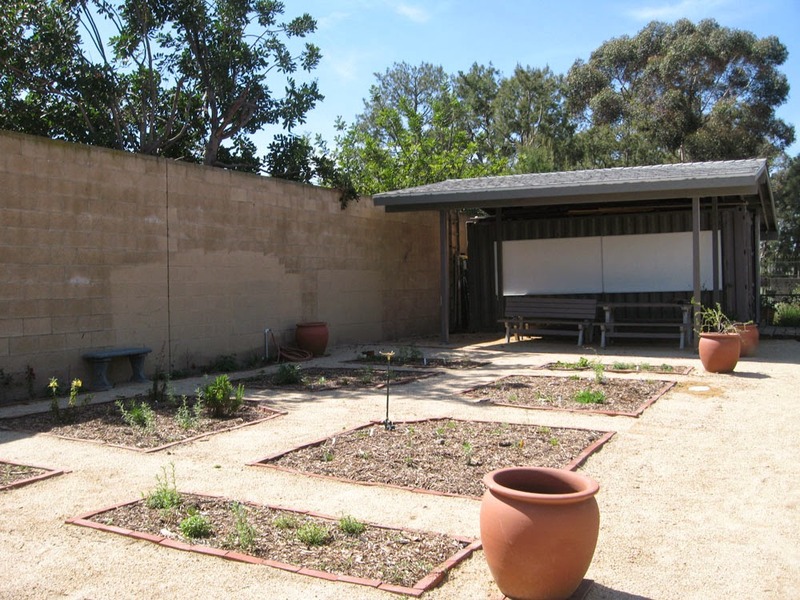 After the decomposed granite pathways were laid, the garden and open air classroom looked quite nice (below). Obtaining plants for the Garden of Health has been a bit of a challenge. Some plants are readily available, while many others are ‘specialty natives’ available from only a few sources. 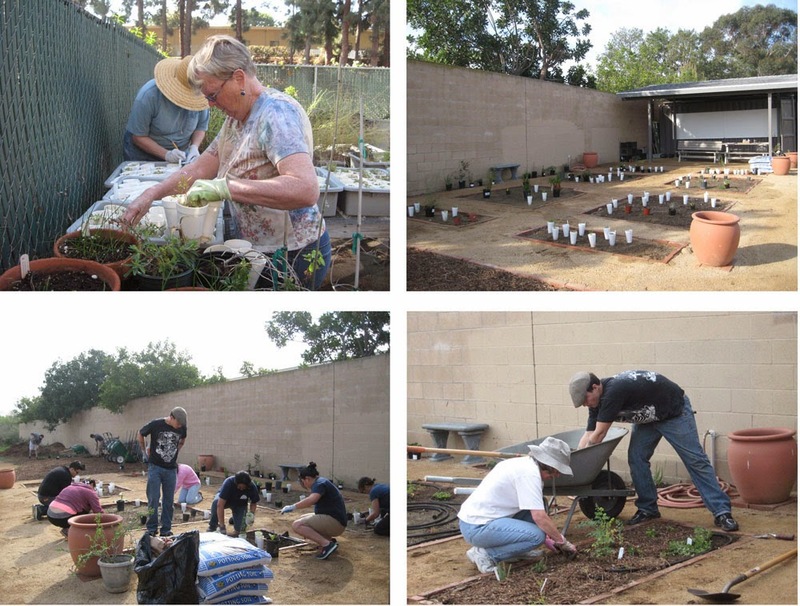 As a result, we’re raising many of the plants from seed in the Cal State Dominguez Hills native plant nursery. Some of the plants won’t be ready for planting until next winter. That’s probably a good thing as the drought promises to make this a difficult summer for new gardens. 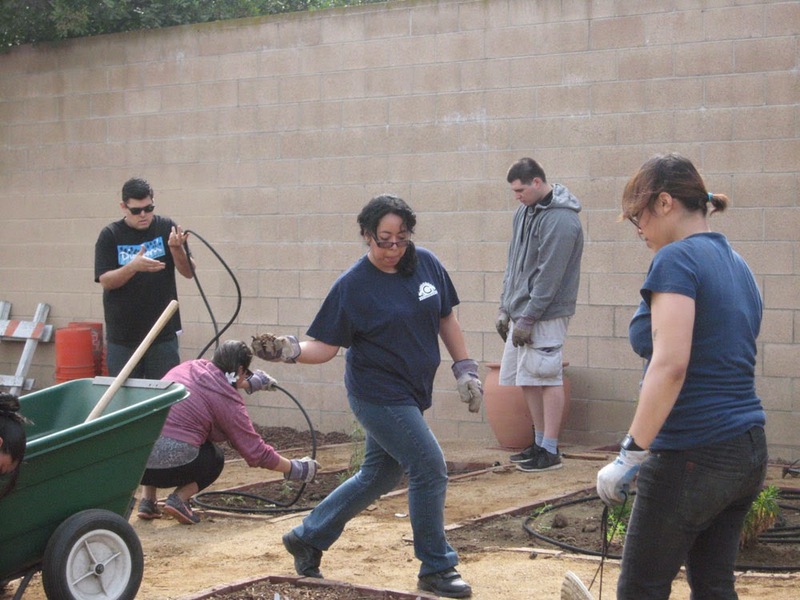 The Garden of Health was planted by CSUDH students and community volunteers on February 22, exactly two years after Mother Nature’s Backyard was planted. The photos above highlight the planting. Fortunately, we had a major rainstorm soon after planting, which helped the plants off to a good start. The plants are growing well despite the drought; we even have a few flowers right now. 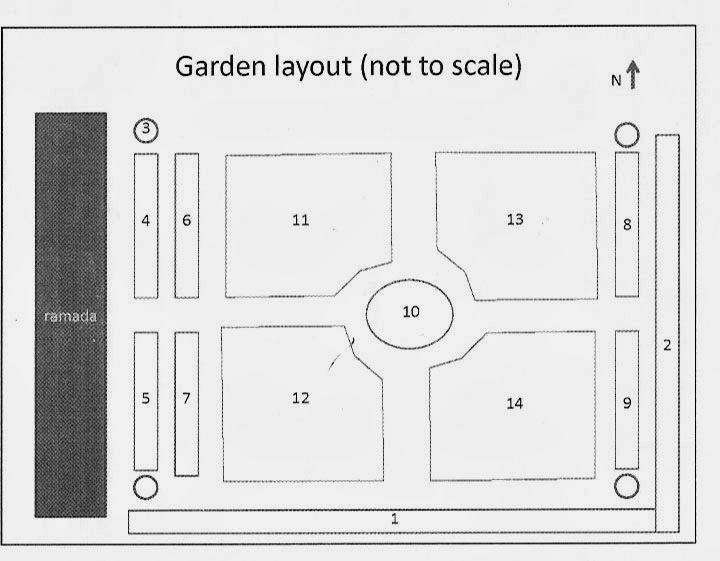 The original garden plan, with plants, is available under the ‘Original Garden Plans’ page. An updated plant list is available under ‘Current Plant Lists’. We’ll keep you posted on the garden’s progress with current photographs and posts featuring the plants. Both Allen’s and Anna’s Hummingbirds visit Mother Nature’s Backyard regularly, so we try to have something blooming all year long. Last month (Feb 2014) we featured another great hummingbird plant – Golden currant. Right now the favored plant is the Hummingbird sage that’s blooming near our back porch. Hummingbird sage is a Salvia (sage), though its growth habit differs from the woody shrubs and sub-shrubs we typically associate with local sages. The name Salvia is derived from the Latin salveo meaning "to save"; many of the salvias are still used medicinally and ceremonially. The name spathacea means "with a spathe", which refers to the large, colorful bracts that enclose the flower cluster. This plant is sometimes known as Borraja Silvestre, Diosa or Diosita in Spanish. All Salvias are in the Mint family, Lamiaceae, which contains the garden mints and many other aromatic herbs and shrubs. Hummingbird sage grows from Solano County, CA in the north to Camp Pendleton in San Diego County. It’s found at lower elevations (< 2500 ft) and mostly within the coastal hills and valleys. It still grows in many spots in the western Santa Monica and Verdugo mountains. In Southern California, this species is typically found in shaded areas in coastal scrub, coastal sage scrub, chaparral, and coastal live oak woodland. It’s usually seen on north- and east-facing slopes and under oaks. Further north it can be found in more open sites in the same plant communities. As seen in the photo (above), Salvia spathacea is a low-growing, mostly herbaceous, ground cover. With a little summer water, it’s evergreen most of the year. The foliage is primary low, to perhaps 18 inches; the flower stalks attain 2 to 2 ½ feet in height. 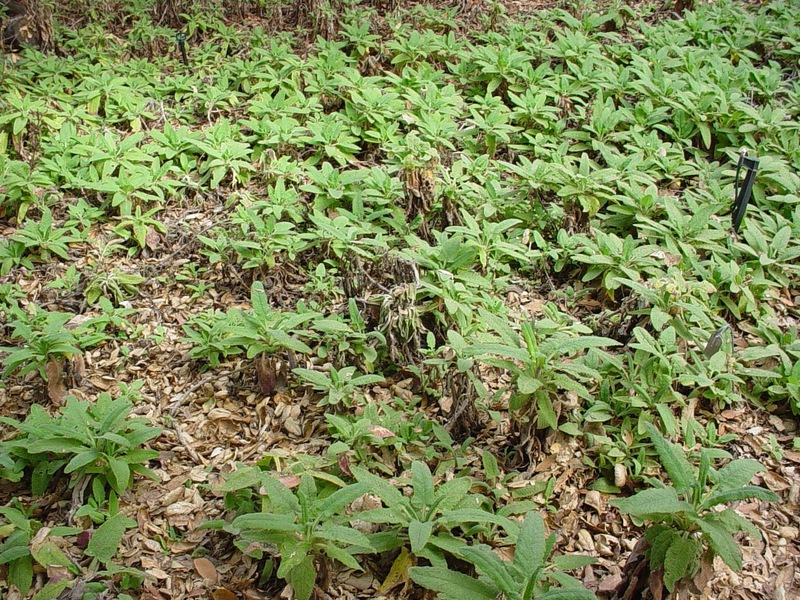 Plants have a spreading habit, typical of the Mint family; they increase in size via rhizomes (underground stems) and will ultimately fill an area if happy. In fact, they are one of our most useful groundcovers in areas that are a bit shady. The leaves of Hummingbird sage are large (to 4-6 inches; 10-15 cm), arrow-shaped to oblong, and succulent. Leaves are opposite, typical of the Mints, and are mostly clustered in a basal rosette (cluster of leaves at the base of the stalk). The upper leaf surfaces are coarsely crinkled while the lower surfaces are covered with hairs. The leaves are quite sticky and sweetly scented. In fact, Hummingbird sage leaves are one of our favorites for tea, hot or cold. For more on making tea from native mints see: http://mother-natures-backyard.blogspot.com/2012/06/making-tea-from-california-native-mint.html. 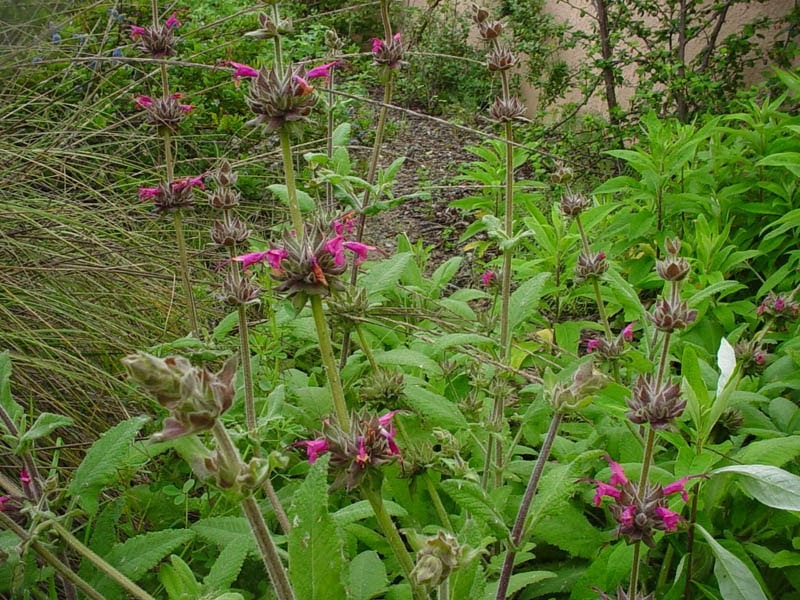 While Hummingbird sage ultimately forms dense mats, its growth rate varies greatly depending on conditions. It spreads more quickly in moist clay soils; more slowly in sandy coastal soils. On a well-drained slope, it may take 4-5 years to provide complete coverage. 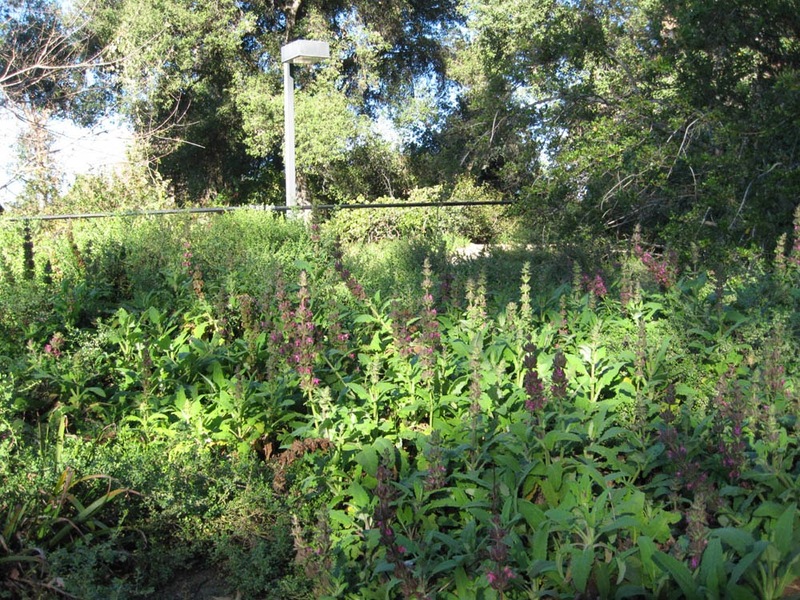 The photo above shows a large, relatively flat area covered with Hummingbird sage. It looks lovely year round. The main bloom season for Hummingbird sage is in the spring. It often begins in February in local gardens (even January in a warm winter) and continues through March or April. In the garden setting, plants will often bloom sporadically from spring to fall depending on available moisture. But the main show is early to mid-spring and it can be impressive! Hummingbird sage is one of the showiest bloomers of our native Salvias. The 2-3 ft tall flowering stalks contain several whorls of flowers surrounding the stem. The individual flowers are large (to 1 inch long), pink to magenta, and shaped like a typical Mint flower. The flowers have 5 fused petals and 5 fused sepals, giving them a bilateral symmetry (two halves that are mirror images). The bracts (fused sepals) are usually a dark purple/magenta, contrasting nicely with the brighter flowers. The pollen-bearing stamens extend beyond the petals. The pollinators (hummingbirds) pick up the pollen on their heads and bodies as they reach deep within the flowers to reach the nectar. Pollen is then deposited, unintentionally, at the next flower. The long stamens, tubular shape and color of the flowers all suggest a long-standing, mutually beneficial relationship between hummingbirds and Salvia spathacea. Seed-eating birds enjoy the dried seeds. Hummingbird sage is usually used as a groundcover, often in partly shady areas under trees, on the north or east side of walls, etc. It also can be grown on coastal bluffs (tolerates salt spray) and is a good choice for slopes and banks in general. We’ve grown it on a 24% grade (fairly steep) where it does well, successfully binding soil and preventing runoff. It is striking alone when grown in broad swaths. We also like to combine it with the Wood mints (Stachys species), Catalina perfume (Ribes viburnifolium), Yarrow (Achillea millefolia) and even Berkeley sedge (Carex tumulicola). Under California native oaks, consider planting it with Ribes species, the Snowberries (Symphoricarpos species), native ferns, native honeysuckles (Lonicera species) and Fendler’s meadowrue (Thalictrum fendleri). In western Los Angeles County, Hummingbird sage is best with some shade except on the immediate coast. Dappled shade or morning sun is best for plant health and abundant blooms. We’ve grown this plant successfully in soils ranging from dense clays to very sandy – it does fine in both extremes. While actually quite drought tolerant once established, hummingbird sage looks best with occasional summer water (Water Zone 2). We water ours about once a month from June to Sept. (our dry season), making sure that the ground is dry at a depth of 4 inches before watering. Try to water on a day that’s a bit overcast/cooler if possible – and water either very early morning or in the evening. Some gardeners like to rinse off the leaves occasionally in summer. The only other ‘management’ required is removing the spent flower stalks, which can be done anytime from summer to fall. Let the birds eat the seeds, then prune off the stalks before they drive your tidy side crazy. 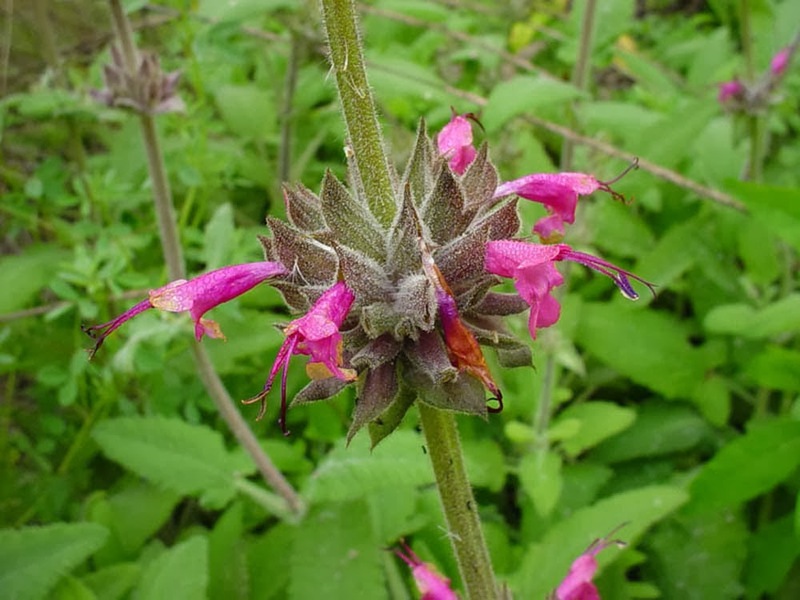 As mentioned above, Hummingbird sage leaves make wonderful tea – probably the main use for this plant over the millennia. The tea can be used to make delicious jelly or syrup. Native Californians also use the tea for colds and sore throats and the plants do produce mild antimicrobial chemicals. A warm bath with the leaves is used for rheumatism and other joint pains. You can chew on the leaves on a hot day to make you feel less thirsty. And the flower stalks (even dried) make a unique contribution to flower arrangements. We hope you’ll consider Hummingbird sage if you need a part-shade groundcover. This plant provides a great deal of benefit from a single plant: hummingbird/bird habitat; food & beverage; medicinal value; great beauty.